Hydrogen is a software synthesizer which can be used alone, emulating a drum machine based on patterns, or via an external MIDI keyboard/sequencer software. Hydrogen compiles on Linux, Mac OS X and Windows. 1. Mode "Can��" i mode "Patr�"
Depending on the branch you are compiling you will need to use cmake. Check the INSTALL.txt and the README.txt files for more info (located in the top level dir once you downloaded the sources). First of all you should make sure that the audio engine is configured properly. The preferences dialog can be accessed via the tools menu (tools -> preferences). On the "General" tab (Figura�1.1) you can choose to automatically reopen the last used song and/or playlist. This can save you the trouble of having to reopen the song you are working on every time you open Hydrogen. Auto loading the playlist can come in handy when you are using Hydrogen live. If you want to use Lash for session management you should enable it here so Hydrogen allows interaction with Lash. If jou are using Jack Session for session management you have to option to let Hydrogen automatically save the song file in the Jack Session Directory. The Max number of bars in a song can be set here (currently limited to 800) and if you want to use rubberband for sample time-streching (see Secci�9.5.2) you need to enter the path where rubberband is installed on you system here. 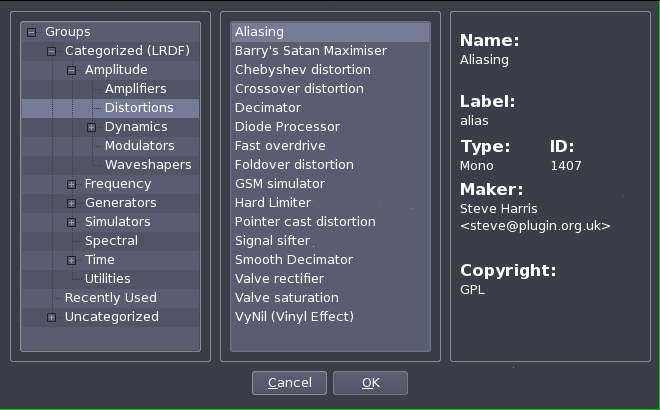 From the "Audio System" tab (Figura�1.2) it is possible to modify the audio driver being used (OSS, Jack, ALSA, PortAudio, PulseAudio, CoreAudio) with its buffer and sampling rate (unless you are using JACK, in this case the audio driver configuration should happen before starting the JACK server). We can set some features of Hydrogen like "Create per-instrument outputs" this will create 1 output per instrument that you can connect to any other Jack enabled application. This can be useful if you want to add effects to a single instrument with jack-rack for example. "Connect to Default Output Pair" connects the output to the default ports: uncheck this if you want to connect the JACK output to other ports without having to disconnect them first. Also keep an eye on the value of "Polyphony": depending on your CPU you may want to change the max simultaneous notes in order to prevent hydrogen from overrunning the audio driver. The "Interpolate resampling" parameter allows you to select your preferred interpolation methode. jackd: El controlador Jack �s un servidor d'�udio professional que permet molt baixa lat�ncia i es comunica amb altres programes d'�udio. Recomanem ferventment usar aquest controlador per treure-li tot el suc a Hydrogen. El servidor JACK s'iniciar� autom�ticament si no est� ja en �s. OSS: The Oss audio driver uses /dev/dsp and it's based on the OSS interface which is supported by the vast majority of sound cards available for Linux; this said, the use of this audio driver blocks /dev/dsp until Hydrogen is closed i.e. unusable by any other software. Use it as last resort. PulseAudio: a driver for the cross platform PulseAudio sound server. The "Midi System" tab (Figura�1.3) contains all MIDI settings. Here you can choose the MIDI driver (ALSA, PortMidi, CoreMidi or JackMidi) input, and channel(s) that Hydrogen should respond to. If you want to use Jack Session management you should select the JackMidi driver. Jack Session management can only (re)store Jack midi connections. You can also define midi bindings: link a midi note/message to an action. To do this simply press the red 'REC' button left of the event-action binding line. A popup will inform you that Hydrogen is waiting for your input. Press/hit/turn the key/pad/knob on your midi keyboard (or controller) that you want to link to this action. The popup will close and the Event Param value will now show the midi note value of the key you pressed. Once this is done you can select an Action from the action drop-down list. Note that some actions (like SELECT_NEXT_PATTERN) also require an Action Param that references the pattern you want to select with this midi action. See Secci�10 for more info on Midi actions. The "Audio Engine" tab (Figura�1.5) is a window that shows various stats about Hydrogen and the audio driver. In case JACK is used, buffer and sampling rate should be set before starting Hydrogen (JACK automatically starts when an application tries to connect). Note that the Audio Engine tab is only available if Hydrogen was complied with debug support. *.h2pattern: Fitxer XML que descriu un patr�. Els patrons s�n un grup de polsacions gestionats per l'etidor de patrons. *.h2playlist: XML file describing a playlist. A Playlist is a (ordered) group of songs. *.h2drumkit: es tracta d'una carpeta comprimida que cont� totes les mostres de s� que composen un kit de bateria i un fitxer XML de descripci�. Els kits de bateria s�n b�sicament un grup de mostres de s�. The Main UI comes in 2 flavors : the (classic) Single Pane mode (ideal for large- and medium size screens), and the Tabbed mode (optimized for netbook screen sizes). Below you can see the main UI split up in 5 parts : the Main Menu, Main Toolbar, Song Editor, Pattern Editor and the Instrument and Sound Library Editor. These sections will be explained in detail further down in this manual. Projectes: aquest men� ofereix funcions relacionades amb els fitxers. Instruments: aquest men� cont� funcions d'instruments i kit de bateria (llibreries de s�). Importar llibreria - Importa un kit de bateria del sistema d'arxius local o el descarrega d'un lloc remot mitjan�ant alimentaci� XML (XML feed). El fitxer XML prove�t NO compleix els st�ndards RSS (veure la p�gina web d'Hydrogen per a un exemple). Per a carregar un kit de bateria en la sessi� de treball actual d'Hydrogen, llegeix Secci�8. Tools: opens the mixer, the director, the playlist editor, the instrument rack and the general preferences window. Editor de llistes de reproducci� - Una eina per a gestionar llistes de reproducci�. Director - Open the director window. Mesclador - Obre la finestra del mesclador. Banc d'Instruments - Obre el panell del banc d'instruments. Prefer�ncies Obre la finestra principal de prefer�ncies. Llegeix Secci�3 per m�s informaci� sobre la configuraci� d'Hydrogen. Debug: tools mainly for debugging and monitoring Hydrogen (only available when compiled with debug support !). acci� de depuraci� - Inserta una instrucci� per a la depuraci�. Imprimir Objectes - Imprimir a stdout (sortida per defecte) l'actual mapa d'objectes. About - The usual window with license information, acknowledgements, etc. Pilota la can�� utilitzant els botons d'inici, aturar, pausa, etc. Escull entre mode "patr�" o "can��": En mode "patr�" nom�s se sentir� el patr� seleccionat, mentre que en el mode "can��" se sentir�n tots els patrons utilitzats. Main controls to start [Hotkey = Spacebar], stop, record, fast forward, rewind, loop a song or a pattern. Set Pattern/Song Mode. When Song mode is selected Hydrogen will play the complete song. This is the sequence of patterns you have created in the Song Editor (see Secci�5). When Pattern mode is selected Hydrogen will play the pattern that is currently selected, and thus displayed in the Pattern Editor (see Secci�6). Set measure type and Beat Counter (see Secci�4.1). Shows CPU load and MIDI events. The CPU bargraph gives you an indication of the CPU load. The MIDI led lights up every time Hydrogen receives a midi message. Click J. TRANS to enable Jack transport. If the J. MASTER button is pressed Hydrogen will work as 'master', else it will act as 'slave' to another 'master' program (e.g. Ardour). Note that this applet is only available if Jack Audio Driver is selected, NOT when the Audio driver is set to 'Auto'. The last section gives you quick access to the Mixer window and the Instrument Rack. The LCD screen displays what Hydrogen is up to. It is possible to change the tempo at any time using the tap-tempo and BeatCounter features of Hydrogen. You can do this while the song is playing or while the song is stopped. To change the tempo, hit the , (comma) key in the tempo you want. After the correct number of keystrokes have been detected (see below for details), the tempo will change to the average tempo you tapped the comma key. If you continue to tap, these new taps will become a part of a rolling average. If you tap accidentally, or if you wait too long between taps, the tap tempo counter will start over. The Tap Tempo is a part of the BeatCounter, which is essentially a Tap Tempo on steroids. By default the BeatCounter display is not visible. To see the BeatCounter widget click the upright button (BC) between Song/Pattern mode selector and the BPM-widget, or, simply press the comma key. (,). The tempo that you tap will be considered even beats of the song's beat type. The beat type can be set to 1/8 (for eight-note beats), 1/4 (for quarter-note beats), 1/2 (for half-note beats), and 1/1 (for whole-note beats). To change the beat type use the left +/- buttons. To change the Countdown Counter value, use the right +/- buttons. The Countdown Counter value can be set between 2 and 16 beats. (I.e. if you set the beat to 6, you will have to tap 6 times before the new tempo is computed and set.) When the display shows an R, it means that the BeatCounter is ready to start from 0. When you tap the comma key, the R will change to 1, and will increment with every keystroke until it reaches the Countdown Counter value (shown just below the 'R'). El bot� del fons a ma dreta controla la funcionalitat comen�ar-autom�ticament, i s'activa entre S i P. P significa (Reprodu�r), en aquest estat la can�� assignar� el tempo autom�ticament i es comen�ar� a reprodu�r quan hagis entrat la quantitat correcta de polsacions (si no s'est� ja reprodu�nt, clar). D'aquesta manera, si tens el ComptadorDePatrons configurat a 4/4, pots polsar 1-2-3-4, i comen�ar en la pr�xima polsaci�. Quan es mostra S (per Configura PPM), l'auto inici est� deshabilitat. Per exemple: suposem que est�s en un grup, Hydrogen, i tens un sintetitzador software controlat per Seq24)... i vols que tot comenci alhora. Configura el tipus de ritme a 1/4 i el nombre de polsacions a 4. Habilita l'auto-inici (mostrant P). Compta al grup 1-2-3-4 (mentre li vas donant a la coma) — i tothom comen�a a l'1. Un altre exemple: En la mateixa situaci�, per� la can�� no requereix d'Hydrogen o sintetitzadors fins a una estona despr�s. Mentrestant, un hum� (p.e. el guitarrista) anir� configurant el tempo. En la mesura anterior en la que hydrogen se suposa que ha de comen�ar, polsa la coma 1-2-3-4 amb el ritme... i ja ho tens a la pr�xima polsaci� (amb el tempo correcte). Si est�s utilitzant el transport JACK, el ComptadorDePolsacions continua funcionant. Si algun altre programa �s el Mestre del Transport JACK, Hydrogen respondr� als events de canvi de tempo des d'aquella aplicaci�. Fixa't que en aquesta situaci�, Hydrogen se suposa que ha de ser un esclau, pel que la funcionalitat del ComptadorDePatrons ser�n desactivades o no funcionar�n correctament. Si Hydrogen �s el mestre del transport JACK, els canvis a Hydrogen es veur�n reflectits en altres programes (si ho soporten). Beat counter drift compensation in 1/10ms — adjust to compensate for latency between the keyboard and the program. Beat counter start offset in ms — adjust the time between the BeatCounter's last input stroke and when the song starts playing (if auto-start is activated). Fixa't que aquests valors poden estar configurats a positiu (+) o negatiu (-). Per tal de trobar valors �tils per a aquests, necessitar�s jugar-hi un temps. Am�s, pots voler utilitzar valors diferents depenent de la velocitat del teu maquinari, dispositius d'�udio, controladors, etc. Utilitzar el ComptadorDePolsacions b� necessita pr�ctica. The "Song Editor" (Figura�2.4) gives an overview of the whole timeline of the song (e.g. intro, verse, bridge, chorus and so on); each blue colored square on this panel represents a complete bar as shown in the underlying "Pattern Editor" panel. The song editor gives you complete freedom to add/remove patterns to the song and to move or copy any part of your song. Esborrar completament tots els patrons (demana confirmaci�!). Crear un nou patr� (i demana pel seu nom). Moure el patr� seleccionat amunt o avall. Note that you can also just drag-and-drop a pattern up/down in the pattern list. Enable Select Mode. This mode allows you to select a part of the song and delete/move/copy it. Once you have selected a part of your song you can delete it by pressing the Delete button. You can move it by simply dragging your selection to another location, and you can also copy you selection by Ctrl-dragging it to a new location. Enable Draw Mode. This mode allows you to create a song by drawing blocks on the song canvas. Clicking a square on the song canvas will add a pattern (the square will turn blue), clicking it again will remove that pattern from the song. set Hydrogen to "Single pattern mode" or to "Stacked pattern mode". For more info on this see the SELECT_NEXT_PATTERN midi action in Secci�10. This section describes how you can define tempo changes and how you can add tags to your song. The majority of songs consist of several parts (intro, verse, chorus ...) and often these parts will have a different tempo. Hydrogen provides an easy way to let you change the tempo of a song at any given moment in the song. This is done by adding Tempo change Markers to your song. To add a Tempo change marker to your song you first need to enable the 'BPM' option (the BPM button is located just above the Song editors main controls). Once this is done the horizontal bar next to the BPM button changes to a ruler with marks at every bar. Now simply left-click this ruler at the bar you want the tempo to change and a window will pop up where you can enter the new tempo. Once you have entered the new tempo and clicked OK, the tempo change will show up on the tempo ruler. If you click the Tempo marker again you can edit the tempo, change the bar or delete the tempo marker. In addidtion to changing the tempo when the song switches from intro > verse, it is also very handy to have a clear indication of this tempo switch (or any other event in the song). For this purpose you can also ad Tags markers to the song. These Tags are short text messages you can add to your song at any given moment that will be displayed whenever the song playhead passes by that Tag. To add a Tag to your song simply middle-click on the song ruler (just below the tempo ruler) and a window will pop up where that allows you to add text for any bar. Once you are done you will see a small blue 'T' in the song ruler for every tag you have entered. Middle-click anywhere on the song ruler to edit the tags. The Director is your best friend when you need a quick overview of what Hydrogen is currently doing. This comes in very handy when you are recording a song, or if you are using Hydrogen live on stage. Edit : will open the selected pattern in the Pattern Editor. Copy : will copy the selected pattern to a new pattern in your song. Note that patterns with the same name are not allowed. Delete : will completely remove the selected pattern from the song. Fill/Clear : will open a window that allows you to fill/clear a part of the song with the selected pattern by entering the start- and end bar. Properties : will open a window where you can change the name of the pattern and also assign it to a certain category. Note that you can choose one of the existing categories from the dropdown list, but you can also enter a new category name in the Pattern Category box. Load Pattern : will open the selected pattern in the Pattern Editor. Save Pattern : will open the selected pattern in the Pattern Editor. Virtual Pattern : will open the selected pattern in the Pattern Editor. Virtual patterns are a convenient way of grouping patterns together. For example, say you have a song in which three patterns are always played together at the start of each bar. Previously, the way to do this in the pattern matrix was to explicitly enable the three patterns at each bar. With virtual patterns we can assign a pattern to be a sort of meta-pattern that implicitly invokes these three patterns together when the new virtual pattern is enabled in the pattern matrix. This way, we only need to set one pattern every bar, instead of three. Virtual patterns provide a function that's similar to the regular pattern editor, and one could argue that since a virtual pattern is also a regular pattern, we could have just merged the three patterns into this new one. However, the advantage that virtual patterns provide is that if one of the original three patterns changes, the virtual pattern automatically inherits the change. A virtual pattern can also invoke other virtual patterns. Once your song is finished you can export it to an audio file. This audio file can then be played on your favorite media player or imported in an other audio application. Select one of the available templates (e.g. CD, DAT ...) according to your needs: each template has a specific bitrate, resolution, and audio format (WAV, AIFF, FLAC or OGG). You can tweak the selected template using the samplerate/sampledepth dropdown boxes underneath the template field. Export mode: 'Export to a single track' will export 1 stereo downmix of your song (= the master output). 'Export to separate tracks' will create files for each instrument/track. 'Both' will create a stereo downmix + audio files for all individual instruments. Once all these settings have been configured all you need to do is click the 'Export' button and Hydrogen will generate the requested files. If you are editing a pattern in Single Pattern Mode you will always hear the pattern you are editing when you press play. If you are working in Stacked Pattern Mode you will hear the active pattern(s), not necessarily the pattern you are currently editing. (The active patterns have a small triangle next to the pattern name in the Song Editor). Remember this constraint concerning the grid: if you are working with a resolution of 16 you can't go back to 8 and remove a 16th note. On the other hand if you are working with a resolution of 8 and you try to insert a note in the middle of two bars (looking for a 16 bars precision), notes will be placed in the previous or in the following 8th bar. This constraint can be removed if you disable the whole grid resolution (choose "off" from the grid resolution LCD control). Now you'll be able to place notes wherever you prefer. HEAR : when enabled Hydrogen will play the sample as it's being added to the pattern. QUANT : enables/disables quantization. When enabled the beats inserted will automatically respect the grid resolution currently applied. Drumset / Instrument : when set to Drumset the keys on your midi keyboard will map to the instruments in your drumkit as described in the instrument mapping table below. If you set it to Instrument the keys of your midi keyboard will trigger the instrument that is currently selected. The pitch of the instrument will follow the key you press on your keyboard. This feature is mainly used for non-drum instruments. An example : if you use a sample of a piano for one of your instruments, you will be able to 'play' that piano instrument using your keyboard just like you are playing a piano synth. Note Length / Note off : these are 2 different ways to define the duration of a note. See Secci�6.3 for usage. The section on the left shows you what drumkit is currently selected (GMkit by default) and below that you can see the instruments that are part of this kit. Clear notes : to remove all notes for this instrument in this pattern. Fill notes : this allows you to fill up the pattern with notes for the selected instrument. Depending on the choice you make (fill all, fill 1/2, fill 1/4 ...) notes will be placed at all, 1/2, 1/4, etc of the note positions that are allowed by the grid setting. So be careful not to mix up the 'musical' 1/2-note and the 'fill 1/2' note. Randomize velocity : automatically apply a pseudo-random velocity to each note of that instrument in the pattern. The more velocity you set on the instrument, the more hydrogen will hit �hard� on that instrument when played. The small red and green buttons right of the instrument names are the �mute� (red) and �solo� (green) buttons. The order of the instruments can be rearranged by simply dragging an instrument up/down in the list and dropping it on a new position within the drumkit. Doing so will not change anything to the sequence you have created for that instrument, nor will it change anything to the song or pattern you are working on. It will however, have an impact on the MIDI note mapping : in the table below you can find the link between the instrument position, the MIDI note and the qwerty keyboard keys. The name of the instrument depends on the drumkit that is loaded. This list below refers to the GMkit that is loaded by default. Try to follow the GM midi standard as accurately as possible. This will ensure that switching between drumkits goes smoothly. You are of course free to place your instruments anywhere in your drumkit, and sometimes it isn't even possible to follow the GM standard, but it makes life a lot easier if you do. Keep in mind that it is the position of the instrument (within the loaded drumkit) that is linked to a MIDI-note/keyboard-key and not the name of the instrument. Here's a quick reference of the above bindings for your convenience. In this area you can see your selected pattern and add notes for any instrument. The simplest way to create a pattern is by adding notes using your mouse (and the 'Fill/Clear notes' function described above). Where you can add notes depends on the used pattern size and resolution. If you are using Hydrogen as a pure 'drum' you just want Hydrogen to 'hit' the instrument wherever there's a 'dot' in the pattern. If you are using Hydrogen as an 'instrument', the length of the note becomes very important. There are 2 ways to define the length of a note : in 'Note Length' mode you can add a note by left-cliking, and you can 'stretch' that note by right-click-dragging it. This will change the dot into a rectangle that represents the duration of that note. In 'Note Off' mode you can also add a note by left-clicking, but a right-click will now add a blue dot that represents the end of that note. Note that the color of the note-dot and the vertical bar will change according to the velocity value you have defined. A light shade of gray means a low velocity (low volume) and the higher you set the velocity the darker the color will be, turning red when you reach the point of clipping. The striped black and white area represents a piano keyboard and in the gray area you can choose the octave. By placing a dot on the octave scale and a dot on the 'keyboard' you can choose any note. Drum mode (see Figura�2.7) focuses on using Hydrogen as a drum machine. If you are using Hydrogen as an instrument there is a big chance that the Piano mode is for you. It gives you a complete 'piano keyboard' so you can easily put down your tunes. You can compare the Piano mode to the Note properties Notekey (described above), only here you have a complete piano keyboard, so you dont have to select the octave first. The Mixer window can be opened by pressing Alt+M, by clicking Mixer in the Tools menu, or by clicking the Mixer button on the main toolbar. The Mixer consists of 3 sections (left >right) : the instrument channel strips, the FX plugin rack and the master fader section. The Hydrogen Mixer works very much like a hardware mixer does : it lets you set the volume, pan, FX and several other things for every instrument. From top to bottom : the 2 top elements on the strip are a 'play' button / 'trig' led combination. ( ) The play button lets you trigger the instrument at maximum velocity (handy for checking clipping), and the trig led lights up whenever this instrument is triggered (from the song sequence, or by an external midi controller). Right of this button/led you will find another led that shows you what instrument is currently selected. This is also the instrument that is selected in the pattern editor. As soon as you change one of the settings of a channel strip the instrument will be selected. Just below you can find the Mute and Solo buttons and the Pan(orama) knob. Note that the Mute and Solo states are also reflected in the Song editor. Next are 4 pre-fader FX send knobs that determine how much of this instrument will be sent to the effect plugins in the FX rack. Just below that you can find an LCD peak-value display, and finally the volume fader and VU meter for that instrument. IMPORTANT NOTE : keep in mind that the volume and pan settings that you find on the Mixer are global settings. The per-note velocity and pan settings in the Pattern editor are settings that are relative to the settings in the Mixer window ! A badly designed LADSPA plugin is capable of hanging, crashing, freezing, screeching, overflowing buffers, and even phoning home. If you start having issues with Hydrogen, disable your plugins and see if things improve. Some plugins are not designed for real-time use, and some are just plain better than others. You can select another plugin by clicking the 'Select FX' button. If you quickly want to enable/disable the effect click the 'Deactivate' button (or the Bypass ( ) button in the FX rack). This can be handy for a quick A/B comparison. After you have selected the FX and tweaked it's parameters you can use the FX return knob to increase/decrease how much of this FX will be returned to the master output. Velocity : adds a certain randomness to the note velocity. The higher you turn this knob, the more the velocity will be randomized. Timing : adds a certain randomness to the note timing (lead/lag). The higher you turn this knob, the more the timing will be randomized. Swing : this knob will add a certain amount of swing to the song. Note that Hydrogen can also be switched to 'per instrument output' mode (see Secci�3.2), and in this mode all channel strip outputs will be available in Jack (not just the Master output). This allows you to route the individual instruments directly into any other Jack enabled application (eg Ardour) and gives you a lot more flexibility. On the bottom-right of the Master section the 'FX' button will show/hide the FX rack, and the 'Peak' button will enable/disable the VU meters. First of all a little history on the Sound library and Drumkits. Hydrogen began as a dedicated drum machine but has evolved into a versatile sound synthesizer/sequencer that is capable of generating and manipulating all sorts of sounds. Hence the original "Drumkit" terminology is slightly misleading. You can load any kind of sound into a "Drumkit" and manipulate that sound just like playing a regular synthesizer. This is also the main reason why the Piano mode was added to the pattern editor (see Secci�6.5). As you can see the Soundlibrary contains all Drumkits (System and User drumkits), your saved Patterns and your saved Songs. Each Drumkit is a collection of a number of instruments (snare, kick, sampled voice, bass sound ...) and in its turn an instrument can consist of multiple layered samples. Note that every block has a number of parameters (continue reading for more details). The Sound Library saves you time in managing your drum kits, favourite patterns, and favourite songs. When making new songs and new drum kits, it allows you to reuse and mix the instruments and patterns from other kits and songs. This lists the drumkits that were installed by your system administrator. The location of these System Drumkits is determined by the compile-time prefix. On Unix-like operating systems, this is usually /usr/share/hydrogen/data/drumkits, or possibly /usr/local/share/hydrogen/data/drumkits. These kits are available to all users on the system, and users are usually not able to add to them. Per a carregar un kit de bateria des d'aqui, clica amb el bot� dret al kit de bateria i selecciona Carregar. Aix� canviar� el kit de bateria actual amb el que hagis seleccionat. Per carregar un sol instrument del kit, clica amb el bot� esquerre mes cap a l'esquerra del nom del kit de bateria per mostrar tots els instruments. Amb el bot� esquerre del ratol�, clica i arrossega l'instrument al kit actual. L'instrument ser� afegit al kit de bateria que hagis carregat. Aquests s�n els kits de bateria que tu mateix pots gestionar. Normalment es guarden a $HOME/.hydrogen/data/drumkits. Quan crees un nou kit de bateria, pots desar-lo aqui seleccionant Instruments → Desar Llibreria. You can import existing drumkits from other users via Instruments → Import library. The Import window will pop up with the Internet tab selected. By default the link to the drumkit list (on hydrogen-music.org) will be filled in, and after pressing the 'Update list' button you will get a complete list of all drumkits that are available for download. In the status column you can see if a kit is installed or not. If you select one of the drumkits you will see info about this kit in the right pane of the Import window: name, description, author and also the license type. If you are using Hydrogen for commercial purposes, (creating songs and selling these on-line or in any other way) you need to pay special attention to the license type of the drumkit(s) you are using. If the exact license is not available for a drumkit, do _NOT_ assume that it is a CC (or other open and free license type). Even if the kit is CC licensed you should always check with the author before using the kit in your songs. DISCLAIMER : hydrogen is not responsible for the drumkits that are made available for download by our users, either via the hydrogen-music.org site or via any other channel. You can install a drumkit by selecting it and clicking 'Download and Install'. Once the kit has been downloaded it will be available in the Sound Library under "User drumkits". To save songs in the Sound Library, put them in your data directory underneath the songs folder (usually $HOME/.hydrogen/data/songs). To remove them, remove the file from that folder. Before you save a pattern to the sound library, be sure to give it a title and a category. Right-click on the pattern, select "Properties" and enter the details. You can use one of the categories already provided, or create your own categories by simply typing in a category name. The category name is important, because the patterns will be filed by category in the Sound Library. You can add a pattern to the sound library by right clicking the title of the pattern in the song editor, and selecting "Save Pattern". It will now appear in the Sound Library underneath "Patterns" and the category that you assigned to the pattern. A short recording of a sound, typically between 0.1 and 3.0 seconds long. La for�a amb la que toques la nota. La quantitat de temps per anar de 0 a velocitat m�xima. La quantitat de temps per passar de velocitat m�xima a volum de sustain. El nivell (com d'alt) que aguanta el volum de la nota entre el sustain i el release. �s un tant per cent de la velocitat. No dep�n del temps. Les t�piques mostres que utilitza Hydrogen son: el s� d'un tambor de la bateria, el s� d'un plat, el s� d'una esquella. Quan poses una nota en el patr� (o toques una nota utilitzant MIDI), Hydrogen reprodueix qualsevol s� que hi hagi carregat. Per tant, per ajuntar un kit de bateria necessites recopilar grabacions curtes del bombo, cada tambor, cada plat, el charles obert i tancat, la caixa (oberta o tancada), tocs al canto de la caixa, etc. De totes maneres, no hi ha regles en quant a qu� pot ser una mostra. No es extrany utilitzar Hydrogen per disparar sons que no son de bateria: clips d'�ucio de gent xerrant, un tros d'una can��, efectes de s�, clips d'�udio de pelicul.les, gent famosa parlant... Siques creatiu! In the next paragraphs we will show you how to create a complete drumkit. Keeping in mind the 'Soundlibrary hierarchy' (see Figura�2.12) we will use a top-down approach, so we will start at the Drumkit level and work our way down to the samples. Creating a new drumkit with Hydrogen is done with the Instrument Editor. You can load samples, set envelope parameters, set the gain, and other advanced features like mute groups, a low-pass resonance filter, and pitch randomization. TIP : Instead of creating your own drumkit, you can also use or download existing drumkits using the Secci�8. select Instruments → "Clear All" . This will give you a bank of 32 blank instruments. To delete instruments, right-click on on each instrument and select "Delete Instrument". To add more instruments, select Instruments → "Add instrument" . Selecciona un instrument per comen�ar a editar-lo. Aix� es fa clicant amb el bot� esquerre al nom de l'instrument a la llista d'instruments (a l'esquerra). T'adonar�s que el nom de l'instrument a l'Editor d'Instruments �s igual al que has clicat. Once you have your drum kit working the way you want, select Instruments → "Save library" . You will be prompted for the name of the kit to save. If you wish to overwrite an existing kit, you will need to type in the same name as the kit that you want to replace. Drumkits are automatically stored in the data directory (i.e. $HOME/.hydrogen/data/drumkits). To export a drumkit (for sharing with others), it must first be loaded into your Sound Library. Then, select Instruments → "Export library" from the menu. Select the drum kit that you wish to export, and give it a file name to save it to. In the instrument editor, click on the General button. Here you can adjust several parameters that apply to the instrument (applies to all layers as well). Guany: El volum general de l'instrument. Enmudir Grup: Treu el volum del grup del que aquest instrument �s membre (veure Enmudir Grup). Par�metres de filtre: Bypass, Cutoff, Resson�ncia. �s important que entenguies els Secci�9.1 per tal de continuar. Decay — the amount of time for the volume of the sample to go from full velocity down to the sustain volume. If the value is 0, the sample will immediately skip from the attack volume to the sustain volume. If the value is 1.0, the sample volume will use the maximum time available for the decay parameter. Sustain — the volume to play the note after the decay phase is over, and until the note is released. If set to 0, the note will be silent. If set to 1.0, the note will play at full velocity. Release — the time to fade out the note from the sustain volume back down to 0 (silent). If set to 0, the note will fade out in the minimum amount of time (about 5 ms). If set to 1, it will fade out for the maximum time available. Si la mostra �s m�s curta que els temps especificats, la mostra acabar�, sigui quina sigui la fase de l'ADSR en que es trobi. Si la nota est� en sustain, no dibuixa la nota mentre l'est�s aguantant. Nom�s aguanta el par�metre guany (volum) durant aquest temps. El guany configura el volum general de la mostra. Aquest guany �s aplicat despr�s del guany aplicat a nivell de capa, i abans del guany seleccionat per al mesclador. Si el Guany �s 0, l'instrument no se sentir�. Si el guany �s 1.0, el volum de les mostres no ser� ajustat (p.e. 0 dB). Si el guany �s major, les mostres ser�n amplificades. �s molt f�cil posar el Guany massa alt, provocant que la mostra es saturi. Recorda provar el guany a velocitat m�xima. Si satures la senyal aqui, ser� pitjor quan Hydrogen ho processi. Hydrogen proporciona m�s grups per a enmudir dels que sabr�s qu� fer-hi (cap a 256). Un grup per enmudir �s una agrupaci� d'instruments que s�n mutualment exclusius — nom�s un instrument pot estar-se tocant en un determinat moment. Si un s'est� tocant i un altre instrument d'aquest grup �s disparat, ser� inmediatament silenciat (mut) i comen�ar� a tocar-se l'altre instrument. �s �til, sobretot per a instruments com ara el charles en els que el s� obert i el s� tancat s�n instruments diferents. El filtre �s un filtre passa-baixos ressonant. Si no vols fer-lo servir, clica BYPass per a que es posi el bot� vermell. Si no est� vermell, el filtre est� actiu. El par�metre cutoff ajusta la freq��ncia de tall pel filtre. El par�metre de resson�ncia ajusta com ressonar� la freq��ncia de tall. Si la resson�ncia est� a 0, el filtre �s un simple passa-baixos. La freq��ncia de tall del filtre varia amb la freq��ncia de mostreig de la teva tarja de s�. El rang del bot� (de 0 a 1.0) est� optimitzat per a una freq��ncia de mostreig de 48.000 kHz. The random pitch parameter allows you to randomly vary the pitch of the sample every time it is triggered. The value is set between 0 and 1.0. The pitch change is fairly small: �2 half-steps � value. Using this sparingly can help your sequences to sound more like a real drummer. Hydrogen is capable of generating midi messages that you can use to trigger any external midi device or application. To do this you simply need to configure the Midi out channel and Note for every instrument. As you can see this is a very flexible approach that enables you to trigger samples or sounds from multiple devices and/or apps. Finally you need to make sure the proper Midi routing/wiring is in place and you're set. From now on every time a note is played for that instrument (in the Hydrogen sequencer) a midi message will be sent to your external app/device and trigger a sound. This way you can use Hydrogen as a pure sequencer for other apps, or combine the internal Hydrogen sampler with multiple external apps/devices. If this box is checked Hydrogen will immediately stop any playing sample that belongs to this instrument whenever the instrument is re-triggered. This option is particularly useful when you are using long samples like a crash or some existing audio that you have sampled (like a looped voice in a dance/electro song) For the crash you will need to use the Auto Stop-Note when you are sequencing multiple notes in fast succession and want to make it sound realistic. If you do not check this option the cymbal will start to sound like multiple cymbals instead of only one (since the sample of each individual hit will be played completely). For the voice sample this option is useful if you are trying to get that 'stuttering' effect. Pots carregar v�ries mostres i configurar diferents par�metres de sintetitzador per a cada instrument d'un kit de bateria. Aquesta secci� et guiar� en com crear un nou instrument i carregar les mostres. To begin creating an instrument, select Instruments → Add instrument. This will give you a blank instrument to start from. Ara necessites dues mostres. Qualsevol fitxer .WAV o .FLAC servir�. Hydrogen en proporviona v�ries al directori data/drumkits. A l'editor d'instruments, clica a Capes. Pots posar v�ries mostres com a capes per a l'instrument. Quina �s tocada dep�n de la velocitat de la nota entrant. Clica Carregar Capa i apunta al Navegador de Fitxers d'�udio per a carregar la teva mostra. Fixa't que el Navegador de Fitxers d'�udio et permetr� pre-escoltar la mostra abans de carregar-la. Tamb� et permet carregar m�s d'una mostra a cada moment. Per� de moment nom�s en carregarem una. Una vegada carregada la mostra, veur�s que ara hi ha un 1 a dalt, i que el rectangle s'ha tornat blau cel. Per carregar una segona mostra, clica la posici� just a sota, llavors clica Carregar Capa per posar-hi una nova mostra. Despr�s de portar en ambdues mostres, segurament t'adonar�s que nom�s la primera mostra es toca quan dispares l'instrument. Aix� �s per que has de configurar els rangs de velocitat en les capes. Mou el ratol� per les bandes dels rectangles blau cel i veur�s que tens un cursor per a arrossegar d'esquerra a dreta. Ara arrossega la mostra cap a l'esquerra o la dreta (com una cortina). Veur�s la segona capa apar�ixer. The velocity setting for the layer is 0-velocity on the left, and full velocity on the right. Set up Layer 1 to sound for soft notes, and Layer 2 to sound for hard notes (i.e. Layer 1 on the left and Layer 2 on the right). Per cada capa, pots configurar el Guany i el T�. El t� tamb� t� un bot� d'ajustament F�. Ajusta el Guany per controlar el volum de reproducci� de la mostra. �s necessari ja que �s extremament dificil conseguir un conjunt de mostres que sonin exactament al mateix volum. Ajustant-ho aqui, les mostres que s'han enregistrat massa fluixes es poden amplificar per a que sonin igual que les mostres m�s altes (que segurament s'han hagut d'atenuar). You can hear the sample in a layer by clicking the layer id (just below the 'General' and 'Layers' buttons) and the 'Delete Layer' button will delete the currently selected layer. So far we have created a multilayered Drumkit, set a number of instrument parameters, played with velocity settings and so on. Now it's time to go one step deeper and edit the samples using one of the newest Hydrogen features: the Sample Editor. The Sample Editor allows you to tweak and manipulate your samples. This is a function that will really speed up the creation of a drumkit since you can do the fine-tunning of the sample within Hydrogen. In pre-0.9.5 builds the typical workflow would be to prepare your sample in an external sound editor, import the sample in Hydrogen, test it, go back to the audio editor, import again, test ... The sample editor allows you to do most of the sample manipulation within Hydrogen. This mean less switching between Hydrogen and your audio editor and more time to make music ! The changes you make to your samples in the Sample Editor are non-destructive and are saved per song. So the original sample will not be changed, and you can reuse the same sample in multiple songs with different Sample Editor settings. S-marker (green) : indicates the Start-point (in-point) of the sample. E-marker (red) : indicates the End-point (out-point) of the sample. You can easily move one of the markers by grabbing them close to the letter that marks them. Whenever you grab one of the markers you will see a detail view of the position of that marker on the second (smaller) window on the right, making it easy to find the zero-crossings in the sample. This detail window also has a slider next to it that allows you to zoom in and out on the vertical axis. Think of it as a sort of volume 'zoom'. Underneath these 2 windows you can find (from left >right) : the position of the Start marker, the position of the Loop marker, the Loop mode, the number of loops and the position of the End marker. The position of the markers is expressed in number of samples from the very beginning of the sample. These values will change if you drag the markers, but you can also fine-tune the marker position by using the up/down arrows of the spinboxes, the up/down keys on your keyboard, or by using your mouse scroll wheel while hovering above the spinboxes. Apart from the marker positions there are 2 settings that apply to the Sample Editor's loop function: loop mode and loop number. With the loop function you can repeat the part of your sample that is in between the Loop- and the End-marker. The way it is looped is determined by the Loop mode (forward, revers or ping-pong) and the number of times it is looped is determined by the Loop number. If you want to hear a preview of the tweaking you have done so far, you first need to press the 'Apply Changes' button (@ the bottom of section 3) and then the Play button to hear the result. This section of the Sample Editor allows you to control the Rubberband settings. Rubberband is a tool that can change the tempo of a sample without changing the sample's pitch (and vice versa). If you are using Ubuntu you can install rubberband from the Software Center (rubberband-cli). For other linux distros check your package manager. For other platforms please check the rubberband site . After installing rubberband you should check if the path to the rubberband cli is configured correctly (see Secci�3.1). Sample length to beat : when set to 'off', rubberband functionality is disabled. Normally this parameter should be set to the length of the part of the sample between the Start and End marker, expressed in number of beats. Pitch : this setting allows you to change the pitch of the sample, expressed in semitones,cent. Crispness : this setting does not affect tempo or pitch, but changes the way the sample sounds. Note: If you want Hydrogen to recalculate the sample length on the fly (using rubberband) you must enable the 'RUB' button (see figure above). In the bottom section of the Sample Editor you can see the end result of the tweaks you have made by pressing the Apply Changes button. You can also change the the Volume and Panorama (Pan) of your sample here. This is done by creating 'envelopes' like the ones you find in numerous DAW's for automation. To edit an envelope you first need to select 'Volume' or 'Panorama'in the upper right corner of section 3. The Volume envelope is blue, and the pan envelope is yellow. Left clicking in the bottom window will ad a node to an envelope and also allows you to drag an existing node. Right-clicking a node will delete it. Don't forget to Apply Changes before you play your tweaked sample. Turn down the gain. Every gain knob (i.e. an amplifier), this is a gain stage. With every gain stage you have, it's easy to overdrive your signal — which means the signal gets distorted by clipping. In addition, if you have two samples that, by themselves, peg your meters — what do you think happens when you combine them? That's right, you overdrive the signal again. Si les coses sonen malament i distorsionades, comen�a baixant el guany a la capa... especialment si �s major a 1.0. Llavors passa a baixar el guany de l'instrument, Llavors qualsevol guany en els efectes LADSPA. Llavors a l'atenuador del mesclador. Llavors a l'atenuador del volum de sortida principal. Intenta utilitzar mostres de com a m�xim -6 dB Visualment, aix� vol dir que les mostres arribar�n com a m�xim a mitja escala. D'una altra manera, canvia el guany de la capa aproximadament a .5. Remove all DC offsets from the sample. In a sample editor, there is usually a line down the center of your sample's waveform. This is the zero-line. The beginning of your sample should be on this line. The end of your sample should also be on this line. However, if your signal is a little above or a little below this line, you will hear a click at the beginning and the end of your sample whenever it is played. If your sample editor doesn't provide any tools to fix a DC offset problem, you can eliminate the noise by putting a slight fade-in/out at the ends of your sample. L'ADSR no ha de ser m�s llarg que la teva mostra. Si tens una mostra curta, no importa quant posis a l'atac i decay — la mostra acabar� igual. Things change with the sample rate. If you have a really nice setup with all your parameters painstakenly tweaked... things will change if you change the sample rate of your audio card. Many of Hydrogen's internal settings and parameters are based on how many samples go by, not on how many seconds go by. The sorts of things that change are: anything time-base (like attack and release) and anything frequency based (like the cutoff frequency). In this section you can find more info about defining MIDI actions and how they can be useful for you. Before you can work with midi actions you should have your Midi devices, drivers and connections configured correctly (see Secci�3.3). An Event is an incoming Midi message, coming from a MIDI controller or an external sequencer. The Param. (parameter) value to the right of the Event is the identifier of the note/button/controller that is linked to this Action. This parameter can be entered manually, or automatically by using the Midi learn function (see Secci�3.3). You can also activate the Midi learn function by Shift-clicking most of the gui elements. A 'Waiting for Midi input...' popup informs you that Hydrogen is now waiting for you to press a key or turn/move a controller. If you Shift-click on a gui element that does not support Midi automation a popup will inform you. Next is a list of the available Actions: an Action describes what Hydrogen should do when a specific Midi Event is detected. Els par�metres d'atac, decay i release es configuren tots a partir del nombre de mostres d'�udio. Aix� significa que el temps canvia segons la freq��ncia de mostreig de la teva tarja de s�. El m�xim de temps �s 100.000 mostres d'�ucio (t�picament, 2,27 segons a 44.1 kHz). This section is a quick-and-dirty walkthrough to Hydrogen. Refer to the tutorial for a more detailed overview. Hydrogen has 2 main modes: "Pattern" mode and "Song" mode (refer to Secci�4 for the buttons that activate each mode). When "Pattern" mode is activated the current pattern is continuously repeated. This mode is very well suited to tweak your pattern until it's just right, since the pattern you are working on is constantly repeated. This way you can immediately hear the changes you have made. In "Song" mode the whole song is played. This is useful when putting together the patterns to create the structure of the song. We'll start from the empty song with an empty pattern created when Hydrogen starts up: "pattern" mode should be selected by default. Now let's click on the �Play�button, and while the pattern is playing let's add notes by left_mouse_clicking in the grid of the Song Editor (Figura�3.1). Adjust the grid resolution and BPM speed if needed. Remember some constraints of the grid: if you are working with a resolution of 16 you can't go back to 8 and remove a 16th note; same thing happens if you are working with a resolution of 8 and you try to insert a note in the middle of two bars (looking for a 16 bars precision): they will be placed on the previous or on the following 8th bar (unless you choose �off� from the Grid Resolution LCD in which case you're free to place notes wherever you prefer). Be sure to select the correct pattern in the Song Editor before adding notes in the Pattern Editor! Once patterns are created (Figura�3.2), we can copy/paste/delete them using the Select Mode (see Secci�5.1). Per descomptat sempre es pot utililtzar la finestra del mesclador, tant mentre estem creant els patrons com quan s'estan reprodu�nt. The Mixer frame (Figura�3.3) is made of 32 independent tracks, each of these is bound to an instrument, plus a "Master Output" control and a "FX" button to show and hide the effects panel. Every line features 3 buttons ( ), pan adjust ( ), current maximum peak, volume fader and name of the track. Clicking on will play the selected instrument, cutting the others. The "Mute" button , simply mute that instrument. The maximum peak indicates the maximum volume reached from the instrument. The peak must be in a range of 0.0 and 1.0 (in Figura�3.3 you can see a few volumes too loud). Peaks outside that range will get distorted (especially with OSS audio driver). Keep an eye on each vu-meter and if distortion appears, turn the volume down for that instrument. This is a glossary of general terms encountered when using Hydrogen, synthesizers, drums, or samplers. The definitions here provide more detail and explanation than the simplified ones in the text. For example, the text of the manual would have you believe that an ADSR is the only kind of envelope generator and could only ever control the volume. While the simplified definitions help new users start using Hydrogen quickly, they can lack the nuances presented here. Un tipus de generador d'contorns que et permet controlar l'Arac, Decay, Sustain, i Release. Generalment, els par�metres s�n propircionals a la velocitat. A Hydrogen, el generador d'contorns ADSR nom�s control el volum (atenuaci�). Veure tamb� Generador de Contorns, Attack, Decay, Sustain, Release. Aquesta �s la primera fase d'un contorn ADSR, i �s la quantitat de temps per actirav el par�metre des de 0 a velocitat m�xima un cop disparada la nota. En filtres i mescladors, la quantitat en que �s redu�da una senyal (volum). A filter that preserves a certain band of frequencies, and attenuates (silences) all others. This is often done by combining a high-pass and a low-pass filter. Veure tamb� Filtre, Filtre Passa Alts, Filtre Passa Baixos. Un fen�men que li passa a una senyal quan aquesta �s massa gran per al receptor. El pic de la senyal (que normalment es una corva suau) �s tallat al volum m�xim (tall). Aix� distorsiona el s� i acostuma a ser indesitjable. Un exemple de retall �s quan toques m�sica m�s alt del que el teu altaveu pot suportar. Parts de la m�sica sonen distorsionats. Als filtres passa-alts i passa-baixos, �s la freq��ncia que divideix les freq��ncies que passen i les que son atenuades (silenciades). En un filtre ressonant passa alts, o en un filtre passa-baixos ressonant, la freq��ncia de tall �s tamb� la zona de freq��ncia que �s amplificada. Per exemple, si tens un filtre passa-baixos i configures la freq��ncia de tall alta (p.e. 20kHz)... el filtre no afectar� al s�. Totes les freq��ncies audibles passar�n sense modificaci�. Si baixes la freq��ncia de tall cap a 40 Hz (la corda gruixuda d'un baix), sona com alg� tapant un altaveu. Les freq��ncies m�s altes atenuades est�n per sobre 30 Hz. Veure tamb� Filtre, Filtre Passa Alts, Filtre Passa Baixos, Filtre de resson�ncia. Un cop assolida la velocitat m�xima de l'atac, �s la quantitat de temps per baixar de nivell de m�xima velocitat a nivell de sustain. DC offset is usually undesirable. For example, in audio processing, a sound that has DC offset will not be at its loudest possible volume when normalized (because the offset consumes headroom), and this problem can possibly extend to the mix as a whole, since a sound with DC offset and a sound without DC offset will have DC offset when mixed. It may also cause other artifacts depending on what is being done with the signal. Una manera de controlar (canviar) el par�metre durant el temps com a resposta a disparar, i aguantar una nota. Un control per a ajustar la atenuaci� (volum) en un mesclador. Els atenuadors sempre tenen reductor d'"audio", el que vol dir que la quantitat en l'atenuaci� canvia en una escala exponencial. Un dispositiu que canvia el s� atenuant certes freq��ncies. Un bot� de t� �s un exemple d'un filtre passa baixos. Veure tamb� Filtre passa-bandes, Filtre Passa Alts, Filtre Passa Baixos, Filtre de resson�ncia. En un amplificador, ajusta quant (o quan poc) una senyal �s amplificada (volum). Un guany m�s alt d�na una senyal m�s alta. Un filtre que atenua (silencia) les freq��ncies baixes, i deixa passar les freq��ncies altes. Veure tamb� Filtre, Freq��ncia de tall. A Hydrogen un instrument �s un generador de s� (com un bombo o un tambor). En un instrument pots carregar v�ries mostres (cada una anomenada capa), i tenir una mostra diferent depenent de la velocitat de la nota. Nom�s una mostra es tocar� a la vegada. Suposem que tens una mostra d'un tambor tocat fluix. Si simplement toques la mostra m�s fort —no sonar� igual que si el tambor s'ha tocat ben fort. Si vols que aix� sigui igual al teu instrument, pots carregar una mostra per notes fluixes i una mostra diferent per a tocar fort. A filter that attenuates (silences) high frequencies, but allows low frequencies to pass through. Per fer un soroll. Una configuraci� en un instrument que no deixa que hi hagi sortida d'�udio. Un grup d'instruments (mostres) que s'han d'enmudir (deixar de reprodu�r) inmediatament un cop un altre instrument del mateix grup �s disparat. Un rang de freq��ncies en el que la freq��ncia m�s alta �s exactament el doble de la freq��ncia m�s baixa. Per exemple, el rang de 20 Hz a 40 Hz �s una octava. Igual que de 120 Hz a 240 Hz, i 575 Hza a 1150 Hz. Mentre les difer�ncies de freq��ncies s�n molt diferents (10 Hz, 120 Hz i 575 Hz, respectivament), per a l'oida humana sonen a la mateixa dist�ncia. Un cop la nota s'ha alliberat, �s la quantitat de temps per passar del nivell de sustain a zero. Quan ens referim a un filtre de resson�ncia, aquest par�metre determina quant s'amplificar� (guany) a les freq��ncies a la zona de tall. Veure tamb� Filtre de resson�ncia. Un filtre que amplifica un rang de freq��ncies molt petit. T�picament ser� part d'un filtre passa alts o passa baixos, en el que les freq��ncies amplificades est�n entrades a la freq��ncia de tall. Veure tamb� Filtre, Freq��ncia de tall, Resson�ncia. �s la quantitat de freq��ncies que s�n atenuades (suprimides) quan la freq��ncia canvia (tipicament mesurat en dB per octava). For example, in a low-pass filter the frequencies below the cutoff frequency are not attenuated (they pass-through with the same volume). Same with the cutoff frequency. As you go above the cutoff frequency, the frequencies that are near the cutoff frequency are not attenuated very much at all. However, the frequencies that are much higher than the cutoff are attenuated (suppressed) a lot. This is usually approximated by a straight line (on a log scale) and measured in in dB of attenuation per octave of frequency. Una grabaci� curta d'un s�, normalment entre .1 i 3.0 segons de duraci�. El nivell en que es mant� la nota despr�s de passat el temps de decay. Aquest nivell es mant� fins que es deixa anar. Els dispositius MIDI s�n requerits per a enviar aquesta informaci� al llarg de la nota. Els sintetitzadors utilitzen informaci� per a ajustar varis par�metres de la mostra (t�picament el volum). A Hydrogen, nom�s s'utilitza per ajustar el volum de la mostra reprodu�da.